Accidents can happen anytime and anywhere – at home, on the road, at a public place like the mall or a park, and also the workplace. Even with the effective safety measures put in place to prevent accidents, there is still a possibility that they may occur. Nobody expects for the worst to happen but just one wrong decision can result in a catastrophic accident. All the more reasons why you need to make sure that your workplace is safe for your employees. Whatever industry your business belongs to, there always seems to be an accident waiting to happen; either as a result of wet floors or mistakenly getting your finger caught in a machine’s grill. Even though accidents cannot be totally ruled out from the workplace, they can be effectively managed when they happen. An effective management system that can be used to save lives when an accident occurs involves training the employees to know the basic first aid techniques. The use of first aid applies to all kinds of working environments even in the offices. First aid education can save lives in situations of an employee falling ill or being involved in an accident. The managers and supervisors at the workplace are expected to be highly proficient when it comes to the administration of first aid for minor accidents and severe emergency situations. With this knowledge, the supervisors will be in a better position to protect the employees in any dangerous situation. There are many kinds of medical and health challenges that will require an immediate first aid before the patient is rushed to the hospital. From heart attacks to seizures and workplace accidents, help will quickly come from employees who have had an extensive training in first aid education to provide a temporary relief and prevent any fatalities. WHY IS WORKPLACE FIRST AID TRAINING IMPORTANT? Establishing a good first aid response in the workplace will focus on three major aspects. The first consideration will be putting all the safety measures in place to prevent accidents in the workplace. When this has been done, the management must ensure that the right first aid equipment and supplies are readily available in the workplace. The third consideration will be the training of every employee on how to use all the items that make up the first aid supplies. Executing a first aid response requires team effort; this means that someone has to be trained to lead the first aid response in the case of an emergency. The OSHA regulation mandates that organisations ensure the employees get the most important first aid training. The implications of a poor first aid training can reach as far as legal implications that can be bad for the reputation of an organisation. A well-trained employee will be more confident in working under a management that has shown they are committed to protecting their employees in the workplace. Here are the following reasons that highlight the importance of first aid training in the workplace. First aid education stresses the importance of practising safety at all times to prevent accidents and emergencies. An increased safety consciousness helps the employees to work carefully and avoid accidents. Knowing the dangers of accidents makes every employee shun recklessness while carrying out their duties at work. Moreover, even if an accident does occur – there is a trained person to help anybody who may have fallen victim to it. This directly makes the workplace a lot safer. The costs of enrolling employees in first aid training classes can be quite discouraging. Many organisations try to cut costs by training only few members of their work crew. However, the amount saved in this way is nothing compared to the costs if an accident happens and an employee ends up hurt. There are many legal issues concerning the first aid in the workplace and they need to be addressed. Not having a person who is trained to help those in danger can be very expensive if something happens. The ability to save lives is an empowerment that an individual who has undergone a comprehensive first aid trainingwill have. First aid should be administered within the first four minutes after an accident happens. These first minutes are crucial to saving the life of the victim. Any delays will lead the worsening of the victim’s condition that might be fatal. A quick attention given by someone proficient in first aid will save the life of the victim. preserves lives before the more qualified medical personnel arrive at the scene of the accident. The confidence that comes with a good training in first aid and CPR gives the employee the confidence to know exactly what to do when faced with an emergency situation. The type of first aid treatment given will be aimed at stabilising the victim’s condition until they are taken to the hospital. The feeling of intense pain can make an accident victim lose consciousness and eventually give up. Reducing the pain they feel with first aid procedures and making them more comfortable will keep the victim conscious until professional help comes. People who have had a good first aid education will be more confident in carrying out techniques that will save the life of the victim. It is important to express confidence while carrying out first aid because any form of panic can make an individual take a wrong decision. Having the presence of people who have been well-trained to give first aid will create an air of calmness and professionalism in the workplace. 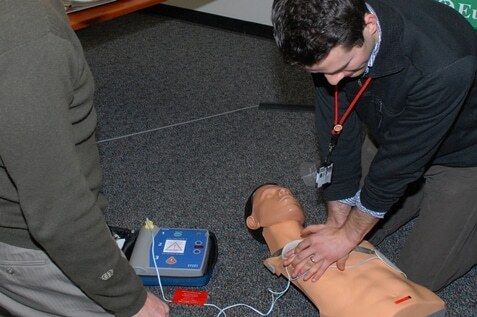 First aid training raises the standard of safety in every workplace. The employees will become more confident in every emergency situation and unforeseen traumatic situations and accidents will be properly handled. Accidents can happen suddenly without any prior anticipation. Alsco believes that the first reaction when an accident happens will determine the extent to which the accident will affect the victims. Alsco offers first aid training courses that can be carefully tailored to fit your company’s size, industry, and culture. A well trained team of employees who have the accurate first aid knowledge will be ready to react appropriatelywhen an accident happens to save lives and provide relief for the victims until professional medical help comes.